After breakfast, Full day excursion trip by motor-road <one and a half hours> to Bago, 84 Km north of Yangon. On the way, visit the Allied War Memorial Cemetery that has 27,000 tombstones of Allied soldiers who lost their lives in Myanmar during the World War Second. Also, stop at Bamboo wares workshops at Htauk Kyan Village, and the "Shwe Nyaung Bin", a tree shrine dedicated to legendary spirits. 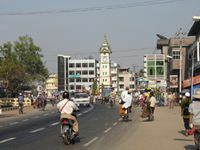 Bago had been the ancient capital of Mon Kingdom in the 15th century. 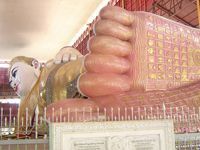 Sightseeing places in Bago are; the "Shwe Maw Daw Pagoda", over a thousand years old which is even taller than the Shwe Dagon Pagoda of Yangon, the ShweTha Lyaung Reclining Buddha Image, 55 metres long and one of the country's most revered. Enjoy Myanmar Meals for Lunch at a local restaurant. Proceeds to Kalyani Sima <Ordination Hall> to study a stone inscription of historical interest. Continue to Maha Cedi Pagoda, from which upper most terraces, magnificent panoramic view of the Bago Plains can be seen. Also, make visits to a pottery cottage, a wood carving workshop and a cheroot factory in Bago. Dinner and Overnight in Bago. After breakfast, drive up to Mawlamyaing, the capital city of Mon State. Sightseeing places in Mawlamyaing are; the Mon Cultural Museum, with a collection of Mon scripting and antiques, the Mahamuni Temple, which Buddha image resembling the one in Mandalay with the same name and the Kyaik Than Lan Pagoda, the highest and most visible edifice in Mawlamyaing. Check-in hotel. Dinner and overnight in Mawlamyaing. After breakfast, start excursion to Thanbyuzayat by motor road. Thanbyuzayat is a small town unfortunately known as a notorious place of the "Railways of Death" during the World War II. Visit the war cemetery of the fallen soldiers of Allied POWs. Return to Mawlamyaing. Dinner and overnight in Mawlamyaing. After breakfast, depart Mawlamyaing for Kyaikhtiyo (Golden Rock Pagoda). 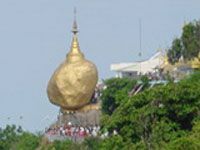 Kyaikhtiyo Pagoda was built on top of the "Golden Rock", a huge boulder completely covered by gold leaf and delicately balanced on the edge of the cliff. From the base camp, visitors have to ride the mountain trucks which drive up the steep and rough 11Km road to reach the Pagoda at the top of the mountain range, over 1,100 meter above sea-level. You can see the beauty of sunset views from the pagoda platform. Check in hotel. Dinner and overnight on the Kyaikhtiyo mountain range. After breakfast, return to Yangon. Lunch, en route. Arrive back to Yangon. Check-in hotel. In the evening leisure hours. Dinner and overnight in Yangon. After breakfast, start sightseeing in Yangon. Visit to Shwedagon Pagoda, the landmark of Yangon and one of the world's most spectacular religious monuments. It is said to be built over 2000 years ago enshrining the hair relics of Buddha. Continue to Chauk Htat Gyi, to see the huge reclining Buddha Image and then to gilded Sule Pagoda, over 2000 years old, and still stands as the landmark of Yangon City Center. Proceed to Bogyoke (Scott) Market where hundreds of stalls of souvenirs and handicraft shops can be visited. In the above tour program, we will tour around by car/ coach to the towns and cities in Mon State such as Bago, Royal City of ancient Mon Kingdoms, the well known "Golden Rock Pagoda", Thanbyuzayat, notoriously known for the "Death Railways" built during the World War II and Mawlamyaing, the beautiful capital of Mon State.